Despite various reissue formats over several decades, the seven original LPs contained in Thelonious Monk — The Riverside Tenor Sessions stood perfectly well on their own at the time of initial release and remain among the highest achievements of a truly golden age. Recorded and released between 1956 and 1961, these seven Monk combo albums were critical in Monk's emergence from a decade of ridicule and neglect to his status at the pinnacle of the jazz pantheon. 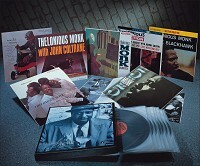 In addition to some of his best recorded piano performances and more than two dozen of his profoundly personal compositions, these albums provide an overview of the era's major tenor saxophonists, with contributions by Sonny Rollins, Coleman Hawkins, John Coltrane, Johnny Griffin, Charlie Rouse and Harold Land. Max Roach, Art Blakely, Roy Haynes and Thad Jones are among the other jazz immortals featured on the essential Brilliant Corners, Monk's Music, Thelonious Monk and John Coltrane, Thelonious in Action, Misterioso, 5 by Monk by 5 and Quartet Plus Two at the Blackhawk. Like the Miles Davis quintet records contained in Analogue Productions' Miles Davis Quintet: The Prestige Recordings, these Monk albums are among the pinnacle of the LP art — and they have never sounded better. I've bought a few "audiophile" discs from Acoustic Sounds, never been very disappointed. I'd like to make clear my setup is very simple and would be frowned on by most as it's low cost. However these records sound amazing even through my simple setup. I listen on a good pair of phones and this is the cleanest vinyl I've ever heard play on my table. Not only is it a great collection it's a terrific quality. I'd buy an Analogue Productions record again without a second thought.